The people around us, the ones we live with, come in daily contact with, and new acquaintances, will flourish if we consistently accomplish these “tasks”. And they are so easy! Such a little effort with a huge impact. People struggle to have a place in life. They feel lost in our world. Life moves too fast. There is too much–too much of so much! 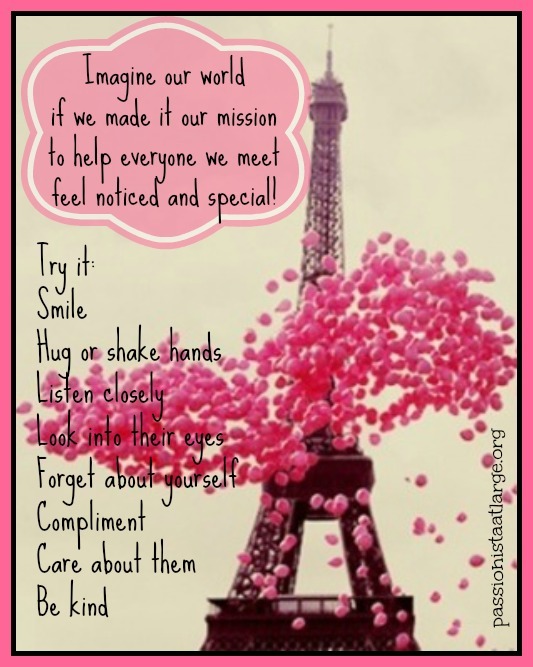 Imagine taking a few extra seconds…seconds that have a big impact on another person. Look into their eyes, actually listen to what they are saying, put your phone DOWN, smile at them. They will feel “noticed” in this great big world. And who knows? Just that little act may ward off loneliness or even despondency–and that gives it a whole lot of worth.